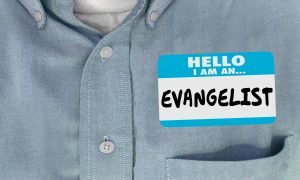 Recruitment Evangelism, is it possible? You’ve heard it before, “You’re either green and growing or ripe and rotting.” This has never before been truer in the world of trade associations and professional societies. Too frequently, what your baby boomer aged members want is not consistent with what today’s recent college graduates desire. What’s an association executive to do? Change your organization’s culture to that of Recruitment Evangelism. Help your long-term members to see the wisdom behind diversity and inclusion, especially in the generational area. Help them not to fear the young upstarts. Help your current members to see the value to them personally in your organization reaching critical membership mass industry market share. Recruitment Evangelism, What’s In It For the Baby Boomers? Legacy; as the senior members of your organization see retirement closer than farther—thoughts emerge about leaving footprints. Help them to see the need for their life’s work to matter and to continue. Making a difference; when senior members mentor younger members, both win. The senior member gets the satisfaction on moving from simply being successful to living significantly. While the junior member accelerates their industry learning curves through accessing the senior member’s lifetime knowledge bank. Legislative power; your senior members have strong opinions on their industry and the role government plays in enabling or inhibiting commerce. The more members (market share), the greater the voice your organization will have locally, regionally, and nationally. More programs; with more members comes more money to focus on the specific needs of various contingency groups represented by your organization—and hopefully some of the new programs developed will be focused on the needs of senior members. Successful succession planning; many of your senior members plan to turn their business over to a child or children. Leaving behind, a strong and thriving association to assist bolsters their confidence in the next generation of company leadership and governance. Direct selling is the most expedient method for member recruitment but with it comes a price; time and treasure. Direct selling can be done in person and this method is the most effective but not the most efficient. Direct selling can also be done over the telephone which is very efficient but not as effective. For successful direct selling, employing professional sales persons is generally the only sustainable method. You can do telethons but the downside there is ineffective member assimilation follow up. Direct marketing, hard copy via the postal service or electronic via the Internet can be marginally effective however extremely expensive. Word-of-mouth, member-get-a-member is the best of all approaches because the cost is minimal, the human power is extensive, and the prospect is sold and assimilated effectively. Give your enfranchised members the correct tools that spell out, in no uncertain terms, the yearly sustainable real-dollar return on investment (ROI) on member-only benefits. This will help them to prove to prospects and colleagues that membership in your organization is a good business decision. Give your recruitment evangelists the organizational structure and support (ie committee opportunities, Sr./Jr. Mentoring programs, YPO programs) to help them effectively assimilate new members. When members join and stay, it’s a win for your recruiters. Give them some public recognition for their efforts at your annual meeting or some other appropriate event. Recruitment; the member joins the organization. Assimilation; the member starts to participate and feel welcomed. Engagement; the member starts to actively participate on their own without the prodding of their mentor or recruiter. Retention; the member is fully enfranchised in the organization and has been for several years. Evangelist; the member is so thrilled with his or her long-term experience that they want to spread the good news about the member-only benefits of participation in their organization and urge others into membership. Recruitment; it all starts again, see step number one. For Recruitment Evangelism to become a reality, at the core of your culture shift needs to be an understanding of the real-dollar ROI your organization delivers. This is the basis for recruiting the younger generations that are dealing with working spouses, high-level involvement with their children, and the knowledge that they can seek industry knowledge quite effectively through the Internet. Your organization might consider abandoning its sacred cow activities in favor of developing communities of reciprocity for members of all ages. Prove to current and new members alike that holding membership in your organization is a good business decision.